This Mahi Mahi and creamy rice recipe has a wonderful rich flavor that can't be beat! Arborio rice (used for making risotto) is a short-grain rice that retains more of its starch content. When cooked, the starch is released making this particular rice more creamy than your ordinary long-grain rice. Add some seasoning and other ingredients and it turns this Mahi Mahi dinner into a succulent sensation! Turn broiler on high. In a large saucepan, heat olive oil on stove over medium-high heat. Add onions and garlic and saute' for 2 minutes. Add Arborio rice and cook/stir for 2 minutes. Add 1 cup chicken broth and boil until liquid is absorbed (stirring pretty constantly). Add 2nd cup of chicken broth and stir until liquid is absorbed. Add 1/2 can of diced tomatoes, black olives, and green chiles and stir until the liquid is mostly absorbed. Remove from heat and cover. Cut Mahi Mahi into 1 to 1 1/2 inch cubes. Toss fish and squash with remaining diced tomatoes, fresh basil, pepper, and salt. 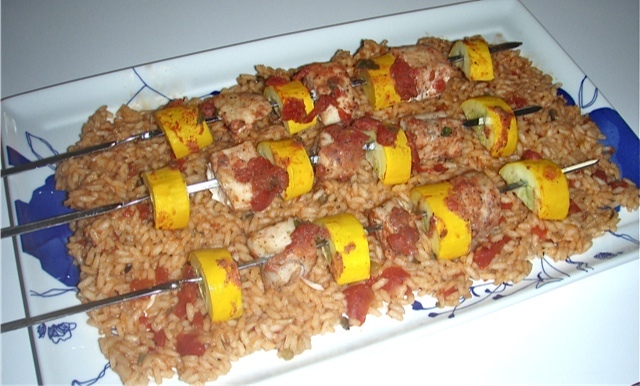 Alternate fish and squash on metal skewers. Spray cooking spray on a baking sheet and line fish skewers on cooking sheet. Spoon any leftover dice tomato and basil mixture over fish. Place in broiler and broil for 4 to 7 minutes, turn over, and broil for 4 to 7 minutes longer. (Four minutes if you like your fish just slightly opaque in the middle and seven minutes if you prefer your fish more well done.) Remove from broiler. Spoon 1/2 cup Arborio rice onto a plate and top with a fish skewer and enjoy! If you'd like a printer-friendly version of this recipe, Click Here. Probably one of the best pizzas we've ever had! With this quick and delicious homemade dough, using instant or rapid-rise yeast, this pizza is very easy to make. Add olives, vegetables, pepperoni, or anything else to make it your own! For sauce: Combine tomatoes, basil, oil, garlic and, salt in a medium bowl. Set aside. For dough: Whisk water, olive oil, sugar, and yeast in a large liquid measuring cup or bowl. Let sit 5 minutes. Pulse flour, parmesan, and salt in a food processor until combined. With machine running, slowly pour in water mixture and process until dough pulls away from the side and starts to form a ball (about 1 minute). If dough seems too sticky, add 1 Tbs more flour. If dough seems too dry, add 1 to 2 Tbs more water. Place dough on lightly floured work space and knead for about 30 seconds. Divide dough into two equal parts. Taking one of the equal parts, use a rolling pin and roll out the dough shaping it into a pizza round. Place pizza round onto parchment paper and brush top with olive oil. Add another piece of parchment paper on top of pizza round (for the next pizza round you roll out). After rolling out the dough for the second pizza round, place on top of parchment paper (so the 2 pizzas are stacked) and brush the top of the second pizza round with olive oil. Reduce heat on grill to medium/high heat. Spray grill pan or cooking grate with cooking spray and place on grill. Take one of the pizza rounds and place on grill pan -- oiled side down. Grill 3 to 5 minutes until dough starts to harden (making it easy to flip). Brush top with olive oil and turn over, grilling for 3 to 5 more minutes. Add dice tomato mixture on top of pizza along with 1/2 cup mozzarella cheese. Grill until hot and cheese starts to melt. Remove pizza and repeat the process with the other pizza round. Add more fresh basil on top for added flavor and enjoy! - Bon Appetit! If you'd like a printer-friendly version of this recipe, Click Here. NOTE: Although the directions say to drain the diced tomatoes, I did not do that the 2nd time I made this recipe; and we loved the juicy taste it gave our thin crust.